I thought it was just an old watering can, full of dust and cobwebs. But I liked the looks of it, the patina, and was happy to have a friend give it to me. I took it home and decided to at least wash it out a bit. I grabbed the nearby hose and just as the first few drops of water hit the bottom of the can I heard a wee voice say, "Blooming radishes! Hold on just a minute. At least help me get out of this watering can before you drown me." You can imagine my surprise when I looked inside the can and saw a tiny garden fairy, no bigger than my thumb. "Well, don't just stare at me", she said. "Help me up out of here." I gingerly put my hand in the can to allow the garden fairy to rest on my index finger, then I carefully raised my hand and brought her safely out and set her down gently on the ground. "I've been waiting for you", she said. "If you don't mind, Carol, can you give me a little dribble of water from the hose? I'm parched." I did as she asked, wondering how she knew my name. Then she went on talking in her wee garden fairy voice. I leaned down closer to hear better. "Since you found me and rescued me from that old watering can, I get to grant you three wishes. But I am a garden fairy so these aren't just any ol' wild three wishes where the skies the limit. There are some guidelines we must follow." With a quick snap, she pulled a scroll of paper from her apron pocket and read the guidelines out loud to me. "I hereby grant you three wishes for your garden. The first wish I can grant is I can send you to see any garden in the world, but please let me know in advance which season you want to see it in. The second wish I can grant is I can let you grow any plant in your garden that you wold like to grow but don't already grow. I will remind you again that I am a garden fairy so I don't have to worry about hardiness zones. Finally, for the third wish, I can remove any pest from your garden and it can be animal, vegetable or mineral, but I can only remove one. Those are the three wishes I can grant you, Carol, please choose wisely." When she had finished reading from the scroll, she rolled it up, put it back in her apron pocket and started to tap her foot while she waited for me to answer. One garden to visit, one plant to grow, and one pest to banish. I began thinking. Then I asked for a day to answer. The wee garden fairy said yes. We agreed to meet by the watering can in 24 hours so I could tell her my wishes. Can't wait to see what you choose. In the mean time I will be thinking about what my response would be. oooh oook....what both Leslie and Lisa said! 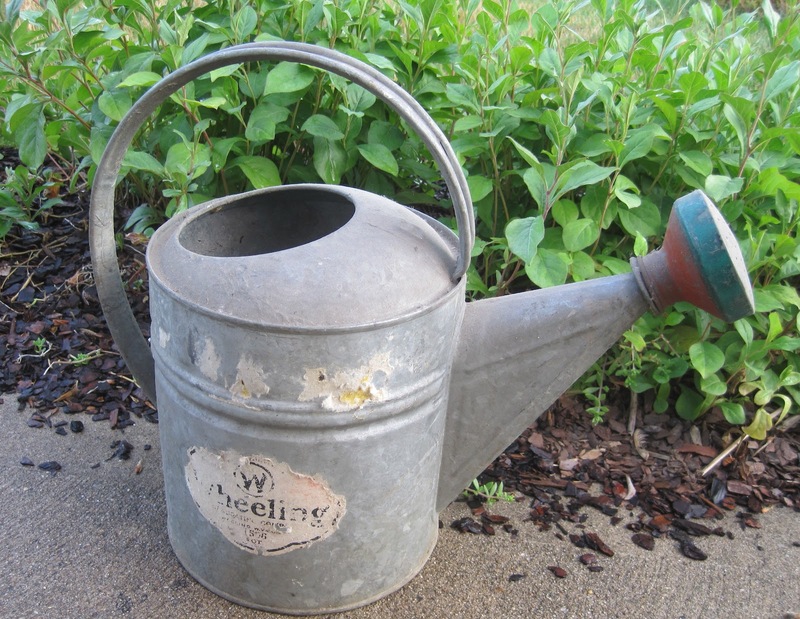 Gotta love those old watering cans! Oh-oh I think I drowned my fairy. I have one of those cans. Should've listened. I wish I had a watering can with a garden fairy. Choosing wisely is always pretty tough. Can't wait to see what your three wishes will be. 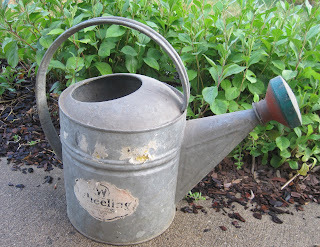 I have an old watering can, from my Mother in law, she bought it in Germany many years ago. It is a 10 liter can...heavy when full. Whoa, the weight of decision making is too heavy! I too will be interested to see your wishes. oooooo, how fun! What an awesome gift! I can't wait to see your wishes! I know the pest one for me--easy...japanese beetles. The last one was easy; Himalayan blackberry. I think my brain just exploded, or maybe it imploded, trying to narrow the first two down to one of each. There are so many gardens I'd like to visit, and so many cool plants I'd like to grow. Does it have to be a currently existing garden? How much magic do garden fairies have? Could you go see the hanging gardens of Babylon? Oh, lotus! I'd grow lotus! Sissinghurst, Blue Himalayan Poppy, and Squash bugs. I'm sure you will use her gift wisely. I'm sure none of us will fail to check our watering cans for fairies from here on out! So far I've only found toads in my watering cans. Waiting to find out your responses. - The garden of Eden?